Posted by elizabethwong in Current Affairs, Democracy, Event, Heritage, Human Rights, Malaysia, Politics. (Press Advisory) Bukit Lanjan State Assemblyman and Selangor State Exco, YB Elizabeth Wong invites you to the Bukit Lanjan Lantern Festival this coming Saturday – 20th September – at Bandar Utama 3 Civic Hall. This festival will be start at 6 PM with the support from the Bandar Utama Resident’s Association (BURA). Food, drinks and mooncakes (halal) will be served. There will be entertainment with performances from a traditional Instrumental orchestra and Fu Sheng Yuan Tai Chi Academy. A home-made lantern competition will be held for children and there will be three categories:- Category I (below 12 yrs), Category II (13-17 yrs), and Category III (17yrs and above) and participants will be judged on originality, design, creativity, and use of recycled materials. The ADUN office of Bukit Lanjan will also have a solidarity ceremony with lanterns for fellow state assemblyman of Kinrara YB Teresa Kok and writer Raja Petra Kamaruddin, who are currently detained with trial under the Internal Security Act (ISA). YB Elizabeth Wong welcomes all Bukit Lanjan residents as well as those living in the surrounding areas to join the celebrations and solidarity ceremony. For inquiries, please contact Special Assistant to YB Elizabeth Wong, Miss Chua at 012-2027054. Power Crazy is the word to describe the actions of the now defunct UMNO Government which has no more locus standi(legal standing) to govern but using whatever dirty & immoral tricks against the New Pakatan Rakyat’s action to takeover the Federal Government. It is very Sad that the legacy of Malaysian Independence is reduced by this Moronic Flip Flop Coward into great disrepute and a laughing stock of the whole world and knowing very well that the UMNO Government has technically collapsed and but he has decided to shamelessly still cling on to power via dubious means like hiding himself via using of the ISA and we cannot imagine that the Malaysia Moronic Flip Flop Coward has now stoop so low and using the Police Deputy IGP as his willing tools especially the Deputy IGP’s clearly taking side as the Police must be neutral and should be not politiking for him. After 51 years MALAYSIA IS NOT GOING ANYWHERE but backwards because of the Oppression from the UMNO goons’ divide and rule fear tactics the Rakyats have matured & you must see all this coming because All The Rakyats of Malaysia are all fed-up & can no longer with-stand the hypocrisies, bullshits, lies and deceits of these UMNO Clowns now in Power ok??? We urge all BN Components MPs with a conscience to do the necessary to make possible a New Malaysia for all Rakyats of Malaysia so that all our children and their children & their children’s children’s future will be safe and secured in the Country we all love and not be intimidated by those UMNO Clowns now in power with their oppressive & fear tactics and in the verge of making Malaysia a Police State if left unchecked otherwise. Save RPK as he is the midst of a conspiracy of the real murderers of Altantuya to silence him for good, instead of being C4ed he could be poisoned and worse off if he is on hunger strike by himself. The Acting IGP is defending the Police position after being made the tools of UMNO’s fear tactics & so he is now making lame excuses for being the Stringed Puppet to be easily manipulated by the Puppeteer, power that be. The Deputy IGP must be held personally responsible for the safety of RPK who has been heard to be tortured otherwise he must be made to eat his own medicine come the New Dawn of Malaysia. Dear world leaders, save Malaysia . Save M’sia from BN dictators. Save M’sia from rampant corruptions. Save M’sia from BN liars and flip-flops. Save M’sia from the rule of the jungle. Save M’sia from biased and BN Govt controlled media (MSM) full of lies. Save M’sia from ISA (Internal Security Act). Save M’sia from BN racists. Don’t let the UMNO/ BN racists fool Malaysians once AGAIN this time. Enough is enough. 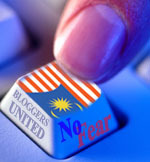 Save M’sia from internet censorship. Save M’sia from immoral and unethical BN regime of AAB and/or Najib and/or Mahathir. Save M’sia from chaos and destruction. Help Malaysians by urging the government getting RPK and all other ISA detainees released unconditionally right NOW! Adun Paroi- NS . http://mohdtaufek.blogspot.com/- ketua dewan pemuda pas. NS. http://lokesiewfook.blogspot.com/- MP Rasah and ADUN Lobak, Ketua pembang, NS. muslim bloggers allaiance- hashim. TV1. presiden muslim bloggers allaiance: zainal. Alamat Pejabat : Pusat Khidmat Masyarakat, Parlimen Kota Raja, 34 Jalan Temenggung 1, Taman Sentosa Perdana 2, 41200 Klang, Selangor. Please help us. This is a Save Our Soul- SOS call. A great Malaysian, Raja Petra Kamaruddin (RPK) are detained unlawfully / under draconian law. (i.e. under ISA- Internal security Act). The Malaysian government has lost ALL sense of humanity and morality. Words can’t describe the pain and the agony Teresa and RPK are going through every minute of the day. They have been harassed every hour. To me, they (ISA detainees) are absolutely innocent. They have not broken any law. Where is the proof that they have broken any law? They have not been given any chance to defend themselves in an open court. is sinking. But they are in a constant mode of denial. The BN government is also constantly lying to / hiding the truth from Malaysians. There is no freedom of expression in this country under the corrupt BN regime. The BN regime treats ordinary Malaysians worse than beasts! We appeal the world, to pressure / call upon / appeal the oppressive BN Government/ regime of Malaysia for immediate release of Teresa and RPK. Please do it for us in whatever way you can. Please do it for us in whatever way you think is right/ the best way. Please do it for us in whatever way think is effective for their immediate release. Please help us get Teresa and RPK of Malaysia released immediately. They are in great danger. Their life is under threat. Dear reader, please write your own appeal ,letter and send to these email addresses. Urge the countries / leaders to pressure on M’sian BN govt to release RPK and ISA detainees. Happy to see this type of social activities going on… In fact, there is a similar activity going on in PJ Old Town tonight, which the Pesta Tanglung & malam buka puasa will be held together at the same place. I am indeed looking forward to see more of such events in future so that people from different races & religions can get together and talk to each other.. I loved the young lion dance – so cute how the lions bumped into each other! Cerys, Cindy, Edwyn and I thoroughly enjoyed ourselves.